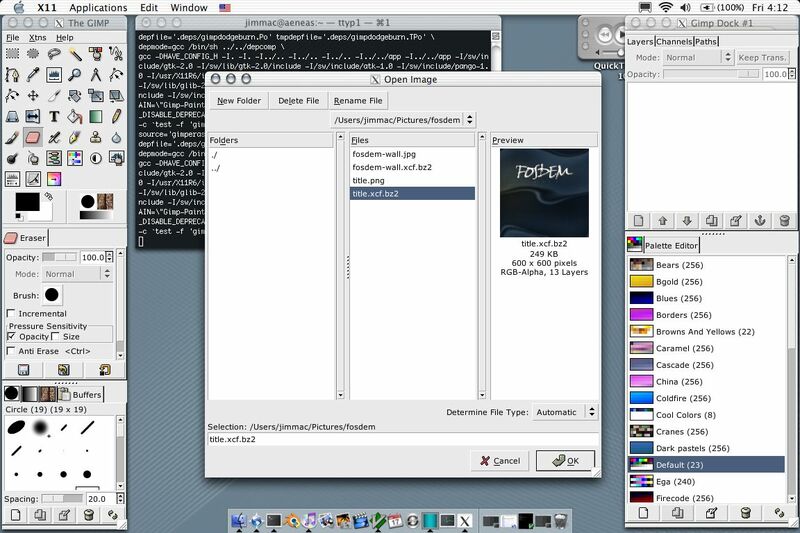 The Gimp is probably one of the best known open-source projects because it appeals much more to the end user than most other tools that concentrate much more on programming, administration and networking. And since its inception it has already done a lot for user interface development on UNIX. Today, graphical user interface environments like GNOME and KDE show promise that the open source scene will be able to catch up with popular desktops. While the Gimp hasn‘t received significant updates for quite some time now and is lagging behind it‘s commercial contenders work on it hasn‘t stopped. Since the last release (1.2) the Gimp developers have enhanced and rewritten the code base significantly and the current development version is slowly but surely approaching release quality. And rumour has it, that the next release of the Gimp will not be version 1.4 but is going to have the name tag 2.0 attached to it. Yes, that‘s true: Gimp 2.0 is around the corner. You may start counting. Even more delightful to know that this release is to be expected at the next Gimp Developer Conference which is about to happen at the upcoming Chaos Communication Camp. The Gimp People are going to set up their own tent and while releasing Gimp 2 will lay out their plans for version 3. This is going to be the second Gimp Developer Conference in Berlin. The first took place three years ago at the premises of Chaos Computer Club Berlin. This is no surprise as the two current project maintainers are both members of CCCB and Project Blinkenlights as well (now you know where I got my rumours from :-). I am really looking forward to the new release as the new Gimp is already running on Mac OS X (using the X11 port) and the new version will make using it much easier. My biggest hope however is that the new modular approach of the Gimp will kick off a new breed of applications incorporating the Gimp‘s frameworks while providing alternative interfaces. Apple developers have taken the core of Konqueror and have built a shiny new browser that melts with the Aqua GUI. New and focussed graphics applications could also take the core of the new Gimp and provide significant alternatives to the established stuff and improve the utility landscape.